The tech industry’s titans don’t think nearly as creatively as Dropbox when it comes to storage. But these startups do. In Fast Company’s April feature on Drew Houston, cofounder and CEO of Dropbox, the 32-year-old confesses that it’s not Google, Amazon, or Microsoft––who compete by offering terabytes of cloud storage for next-to-nothing prices––that keep him up at night. Rather, it’s smaller startups who might see an opening in Dropbox’s very expansive, but very general service, and then create a utility that Houston has yet to fully productize. The new tech war is a battle to own your digital data. Dropbox’s 32-year-old CEO thinks he can thwart the world’s most formidable titans. Houston’s fear of “unbundling” is also likely the motivating force behind Dropbox’s acquisition spree. It’s snatched up more than 20 startups in the past three years, including CloudOn, which let users create documents in the cloud, and Droptalk (no, not because of the name, but likely because it lets users share links and files privately without the use of email. Sound familiar?). Each of these companies could represent Dropbox’s next smart acquisition, or, maybe, its next biggest threat. Branding itself “the first media center in the cloud,” this startup, created by Jonathan Benassaya, cofounder of the streaming music service Deezer, lets users back up all of their digital media, including photos, video, and music from a bevy of sources (Facebook, Flickr, YouTube, and yes, Dropbox), and then beam it to their mobile devices, share with friends, or even view it on their TV with Chromecast. While Dropbox users can indeed consume media via the Dropbox app, its document-centric interface leaves much to be desired, and sharing files often means depleting your friend’s (or mom’s) Dropbox storage as well. In addition, backing up, say, Facebook or Instagram posts to Dropbox requires toying around with an Internet-of-Things service like IFTTT. The notorious Kim DotCom launched the privacy-focused cloud service Mega in 2013, exactly one year after U.S. authorities shut down his file-sharing site, Megaupload. Mega fashions itself a haven for the anti-surveillance crowd, some of whom have cast a wary eye toward Dropbox since Edward Snowden implored users to ditch it and Google’s services because of NSA snooping. Offering a whopping 50GB for free, Mega also promises end-to-end file encryption for users’ data—which, in most cases, means files can’t be read on servers or during transfer without subpoenaing the owner. (There’s also a strict policy against password recovery: “If you cannot remember it, you will no longer be able to access your stored data,” the site warns.) 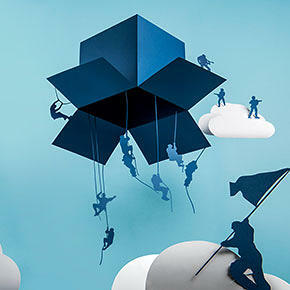 To its credit, Dropbox offers third-party encryption add-ons, and publishes a bi-annual “transparency report” that tallies federal search warrants. DotCom’s credibility isn’t exactly intact—you know, there’s that whole fugitive thing—however, Mega already claims 15 million users, and has become a symbol, at least, of a truly private cloud. “Black Ops” lead Jon Ying works hard to keep the same spirit Dropbox had with 10 employees as it does with more than 1,000. Dropbox’s Carousel app is intuitive and well-designed. It creates a timeline of all the photos users have backed up to Dropbox and lets them share with a tap. What it doesn’t offer, and what Printicular does, is the ability to print them. The app pulls in photos from Facebook, Instagram, Twitter, and Dropbox, and sends them to the user’s nearest Duane Reade or Walgreens for pick-up or home delivery. Sure, there are a ton of folks who care nothing about printing photos anymore. But with spin-off apps like Canvas Print, Poster Print, and Photo Card (think of kids on Mother’s Day), Printicular is tapping into the millions who still do. Dropbox will probably never be described as “fast” when it comes to product development––that’s partly because its very business depends on being cautious and protective of customers’ most precious files. (As CTO Arash Ferdowsi bluntly explains in our feature, “Dropbox just can’t ever screw up.”) However, that caution creates opportunity for smaller players with a singular focus who can move much faster. Take CloudMagic, for example. This email app works with every email provider, including Gmail, Exchange, iCloud, and Yahoo, while Mailbox, which Dropbox acquired in 2013, still only works with Google and iCloud accounts. (That leaves out most email for work––where Dropbox is currently focused most.) Mailbox is often praised for helping users blaze through messages with tools like snoozing and auto-swipe, but CloudMagic integrates with a number of beloved productivity apps, such as Wunderlist, Evernote, and Pocket, that make CloudMagic just as handy, if not more. Users can also save and upload attachments to and from Dropbox. CloudMagic is just one of the apps that could start peeling away Dropbox features. This cloud-based platform is used by thousands of businesses––including CBS, Simon & Schuster, and The Atlantic––to collect, organize, and accept payment with the submission of files such as resumes, video, audio, manuscripts, and applications. Users can collaborate on the submissions (imagine editors making notes in a draft, as I have with others in Dropbox, or jurors accepting entry fees and then reviewing documentaries submitted to a film festival) and access files from any device. As Dropbox marches onward into the business world, Submittable could present a threat––or an opportunity for an extremely wise acquisition. Similar to StreamNation, Plex hosts a cloud-based media server that allows users to upload and stream videos, movies, shows, music, photos, to any device. But Plex takes it to the next level: “any device” includes an impressive list of hardware products and partners, including Roku, Amazon Fire TV, and Vizio and Samsung SmartTVs. It also offers users some unique features when it comes to finding, organizing, and viewing media. Users can automatically upload photos from their phones, save videos on the web to watch later, create playlists, and create multiple user profiles with security PINs. And of course, they can also import files from Dropbox. Recently described as the “spiritual lovechild of Dropbox and Snapchat,” this app, which last year snagged $1 million in funding from Japanese e-commerce giant Rakuten, lets users fling files anywhere using P2P file sharing. The recipient––which could very well be the same person, who simply wants the file on a different device––enters a six-digit key or scans a QR code to retrieve the file. There’s no account creation necessary, no file-size limit, and most crucially, no uploading to the cloud––which means no Dropbox storage to gobble up.